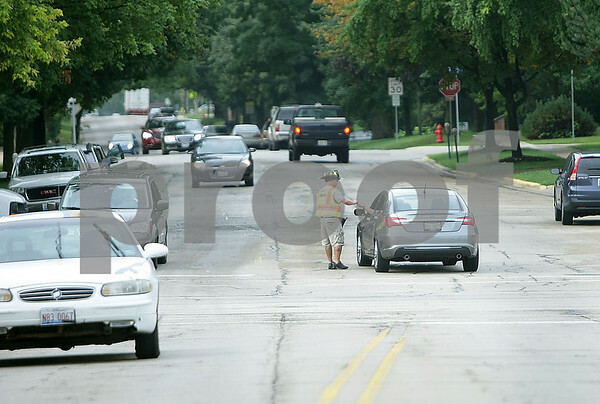 Sycamore firefighter Andy Powers, of International Association of Fire Fighters local #3046, collects donations at the corner of Somonauk and Elm Streets Friday morning, August 22, 2014 in downtown Sycamore during their "Fill the Boot" campaign for the Muscular Dystrophy Association. They will return tomorrow from 8 a.m. until 2 p.m. The local will also have a fundraising day at Culvers in Sycamore on Tuesday, August 26, for lunch from 11-2 p.m. and dinner from 5-8 p.m.